Acabo de comprarme un trench! la gabardina es poreciosa! yo tengo qe comprarme una esta temporada.. es de ahora? o de hace tiempo? porque parece qe qeda genial! Great photo shoot! Love the outfit! Silvia,, es de la temporada pasada! 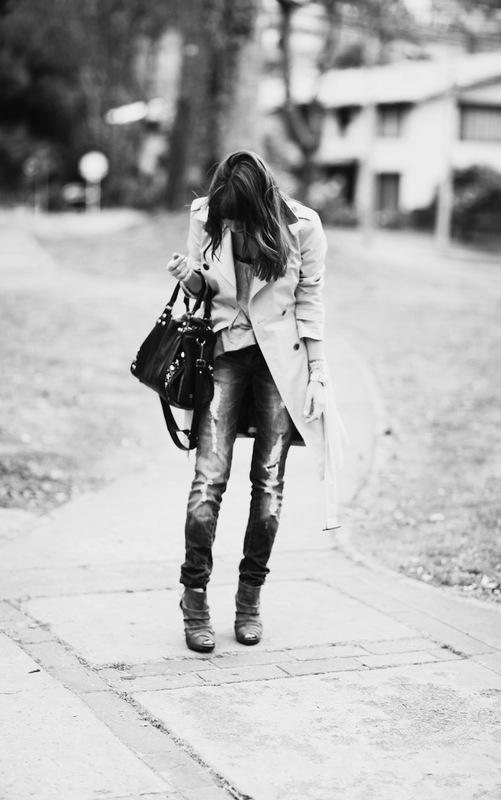 Love the trench with the ripped jeans, so cool and cozy! OMG I love this trench and the bag...the shoes! OOhhhh I love the whole outfit! Awesome as always Juli! Guapísima, me encanta el trench! Really like your blog so glad you visited mine , thank you for that by the way. Let's follow each other if you wish. Love this look! It is in the 90's where I live so I cannot wear any fall clothes yet but I can't wait until it gets cooler out! You jacket and shoes are awesome! I really want your trench right now, love the color and the shape so much! I love your unique way of creating all the posts and your special writing! Not to mention the name of your blog! Hope we keep in touch! I love your choices are available! Hot look!!! Very modern and chic! Love the trench! love this trench, I have the same one bought time ago at Zara...you look so nice! Hi, I like you. You are very beautiful! Me encanta ese trench y los botines estan geniales. Lovely outfit!!!!! I love your watch!! incredible photos!!! with an incredible look!!! i love your blog so much, it's amazing. Love how the ripped jeans allow this look to ride the line between clean composure and thrown together. Great taste! Me gusta el toque desenfadado de los vaqueros rotos, la camiseta anchita y los botines abiertos y como le das el toque más "elegante" con la gabardina y el bolso! Really nice outfit and pictures!!.. vivan las gabardinas, siempre quedan bien, y siempre las puedes poner con todo!!!! I love you beig Trench! really great outfit love the trench and your shoes! thanks for the comment! Hola juli gracias por visitarme yo hace rato no lo hacia pero igual te tengo presente nuevamente te ves super los zapatos divinos y con el look completo va muy bien!!! Nothing excites me more then when I find a new blog with fantastic photo's. These pictures and outfits are truly inspirational. You have fantastic style and I could sit here looking at page after page forever. What a lovely comment Chloe, thank you so much! YOU MAKE ME WANT TO GO PURCHASE THIS TRENCH! Hola preciosa me ha gustado muchísimo el look, un 10 ha la gabardina me encanta. i really love your outfit here, especially the jeans! and i also like your shoes! Your blog is really nice! Love the quality of photos! guau!!! pero que guapisima que estás!!! con el trench vas ideal!!! y tu bolso... y tus botines... me he enamorado de todo!!! fabulosas fotos!!! enhorabuena!!! Trench and boots?! SO jealous! You must live in a place with normal seasons. Aww thanks for lovely comment on my blog! Thank you! I like your trenchcoat, the combination and the photos. you have such a cool blog, following you now! I love everything about this outfit. the shoes are fabulous, and the trench...im coveting very much! Hiiii! Beautiful hotos and amazing combination! I wanna than you for being my first comment on my blog lol! i will be posting soon so I hope you go and visit it then! XOXO Valeria! Hello so cute look kiss. Beautiful, the photos are amazing!! WOW! I absolutely love your look today! i love this outfit! just perfect! You look amazing ! stunning !!! LOVE this look! The trench is perfect for the fall! looking great! Great .. everything. Thank you. I follow. So cute! love that trench coat! but i'm now ready to wear it yet! still enjoying summer!! Bonjour!!! Whaou!!! J aime tes chaussures et le sac aussi!!! The whole look is a stunner! Me encanta el trench y el bolso, son preciosos, besos. the trench and how you styled it is amazing!!! The trench really puts a refined look to this outfit. I love it! :) Dont be a stranger! I like what you have here. wow ! you're soooo pretty! 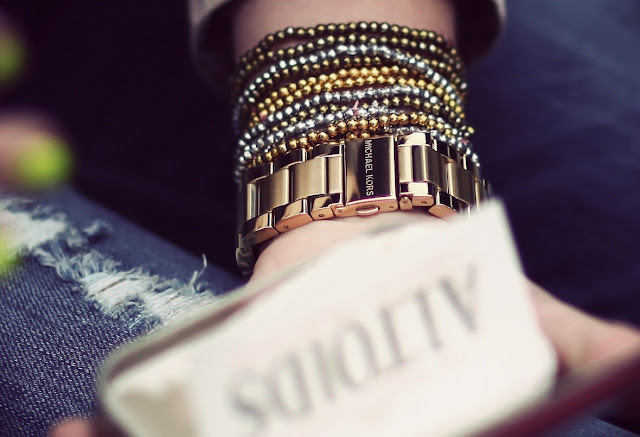 love your style ! it inspire me a lot !